These days, more and more people are gaining an appreciation for fresh baked, homemade bread over store-bought. Some prefer the flavor; others find it healthier or more cost-effective. Traditionally making bread was rather labor intensive, but today you can save time and money is with a bread maker machine. Finding the right bread machine for your kitchen can be a daunting task. There is a flood of models on the market, with a variety of different features and price points, all which can make choosing one more than a little overwhelming. When making a buying decision, you should consider things like maintenance, ease of use, and what accessories are included. Also, take into account the sizes and types of bread you are most interested in making. 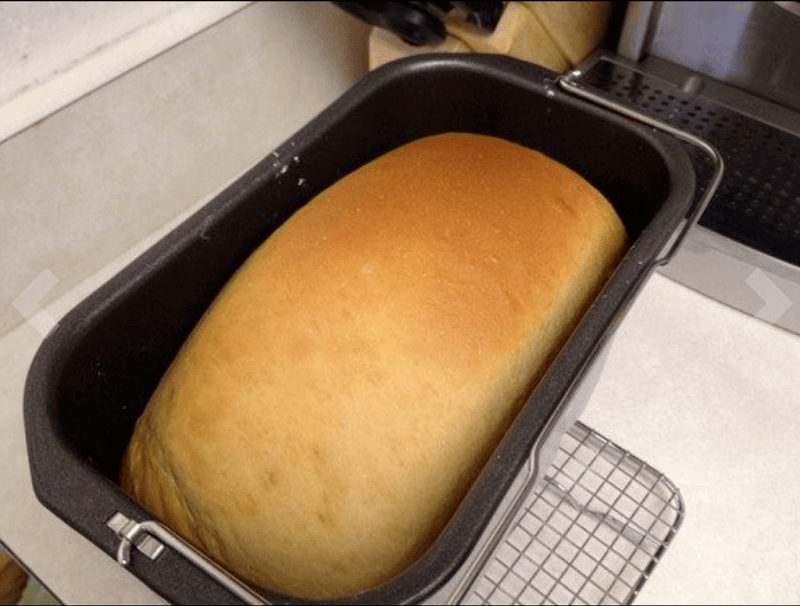 Fortunately, we can help with this review of the West Bend 41300 Hi-Rise Breadmaker, a machine from one of the most well known and trusted appliance brands. Keep reading for a look at the highlights of this machine. The West Bend 41300 Hi-Rise Breadmaker is a favorite of those who enjoy making delicious, artisan breads at home that are just like the ones you find in the bakery. 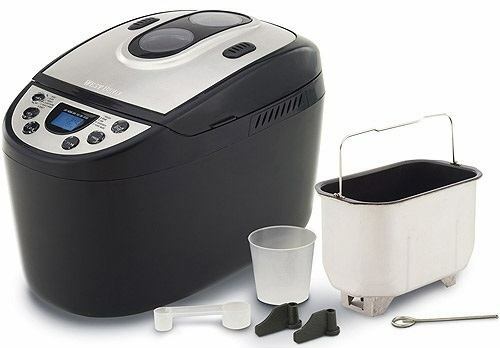 This machine will make you into a 4-star baker with little effort. The West Bend 41300 Hi-Rise Breadmaker offers French, Super Rapid, Whole Wheat, Sweet, Dough, Bake, Jam, Sandwich, and Homemade baking cycles and light, medium and dark crust options. It also gives you the option to add fruit, grains or nuts for healthy, hearty breads. Measuring cup, spoon, knead-blade removal tool and recipe book included. Heater feature to keep your bread warm after it’s done baking. 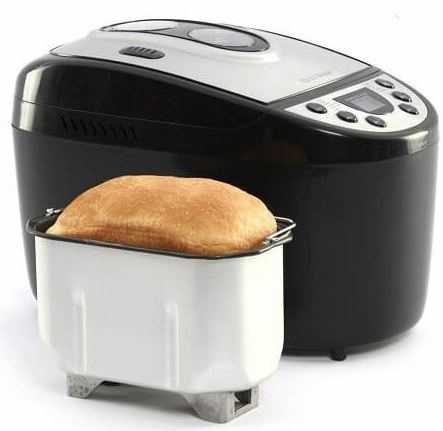 The West Bend 41300 Hi Rise Breadmaker has two blades for efficient and complete kneading, and the delay timer means you can have hot, fresh bread ready for breakfast or waiting for you when you get home from a long day. The enhanced kneading provided by the dual blades gives you the best possible tasting bread. The included recipe book provides tasty recipes for low-carb and gluten-free bread, and the pan and blades are completely dishwasher safe. The easy to read control panel gives you the time left to rise or bake, the temperature and lets you see where your baking is in the process (kneading, rising or baking). This bread maker is solid four out of five stars and one of the most popular machines on the market. With nearly a thousand reviews to its credit, almost all of them are overwhelmingly positive. The dual blade function is especially appreciated. Many users also love how it looks great on their counters and is easy to clean and maintain. The machine needs to be put through a burn-in cycle before first use. It delivers great results every time, producing light, fluffy bread that looks like actual oven-baked loaves. It can bake traditional breads of all kinds along with quick breads, gluten free and low carb loaves. It's built to last. Users rave about how they've used it for years, and it still performs like new. It’s easy to program and one of the quietest machines you can buy. If you want to purchase the West Bend 41300 Hi-Rise Breadmaker, there are a few things you should know first. Read as many testimonials and reviews as you can to be sure this model is the right one for you. West Bend offers a limited 1-year warranty for this model. The machine is covered for any defects in materials or quality. We looked at several listings on line from a variety of retailers. As of this publication, Amazon is currently out of stock on this item and we’re not sure if they will be re-stocking it, as the model has been discontinued. Because of this, purchasing this breadmaker may be a bit of a challenge, but it does appear that some retailers are still carrying it. The West Bend 41300 Hi-Rise Breadmaker is a great buy.It’s durable, built to last, quiet, and easy to use. It’s one of the better breadmakers we’ve reviewed, and its owners love how it provides consistent, great tasting results every time they use it. If you want to make bakery-style artisan bread, or just like bread machine loaves that look like traditional ones rather than cubes, this is the machine for you. 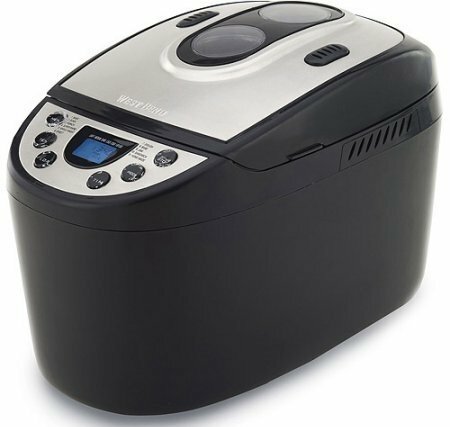 The West Bend 41300 Hi-Rise Breadmaker lets you make a wide variety of breads. Even gluten-free recipes are no problem for this big guy. It's a good buy for anyone who wants to make delicious, freshly baked bread at home and wants a variety of options at their fingertips. We feel confident that if you try it for yourself, you’ll be quite pleased.